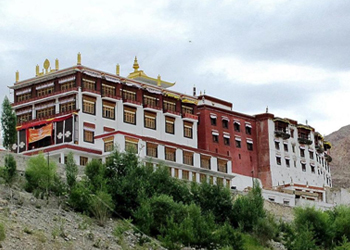 Established in 1515, Phyang Monastery is also known as Tashi Chosang. Phyang Monastery is affiliated to the Red Hat sect of Tibetan Buddhism and is a prominent place of worship that is located approximately 16 km west of Leh in Ladakh. The establishment of this monastery led to the formation of a monastic community that began Digung teachings under the guidance of SkyobaJigstenGonbo. In present times, this shrine is under the administration of Apchi Choski Dolma and the supposed reincarnation of SkyabjeToldan Rinpoche. The monastery houses several small shrines and royal wall paintings within its premises. The 900 years old museum also forms a part of the monastery compound and is one of its main highlights.The museum has on display colourful thangkas, fabulous assortment of idols and ancient weapons of warfare. The festival of Gang-SngonTsedup is celebrated here with zeal in the first month of the Tibetan calendar. The monastery also organises ritualistic dance performances on the second and third day of Tibetan calendar’s sixth month.